Walter Ambrose was 85 years of age, when he passed away peacefully on Sunday, October 7, 2018, at his home in Jordan, MN. A visitation will be held on Thursday, October 11, from 4-7 pm, at Ballard-Sunder Funeral and Cremation 104 West First Street, Jordan and on Friday, October 12 from 10-10:45 am, with a Mass of Christian Burial at 11 am, at St. John the Baptist Catholic Church 313 East Second Street, Jordan. Father Neil Bakker will preside. Walter’s pallbearers will be Ray Ambrose, Chris Mauk, Johnathan Mauk, Mike Hiegel, Jon Baxendell, De’Angelo Pillai, McKinley Hayes and Devin Ambrose. Honorary pallbearers will be Manning Ambrose, Nesan Pillai, Jeya Jeyendran, Brian Hayes, Luke Hayes, Dalton Ambrose, Logan Logendran, Leon Hanka. He will be laid to rest at St. John Calvary Cemetery. 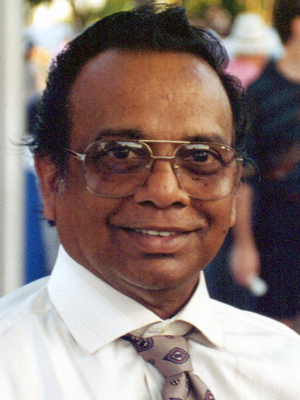 In Jaffna, Sri Lanka, Walter Mariathasan was born on December 27, 1932, to parents Karthigesu and Alice (Solomon) Ambrose. The second of eight children, he was the big brother always watching over the younger siblings. Walter was stern in his actions, but they always had a lot of fun. He attended St. Patrick Catholic School, in Jaffna. Here, he and his brothers enjoyed participating in track and field on the relay team. The Ambrose brothers were invincible. After graduating from high school, Walter began the next chapter in his life. He married Ariyamalar Solomon on September 29, 1958, at St. Patrick Catholic Church. From this union they were blessed with children, Ida, Raymond and Irine. Unfortunately, Walter and Ariyamalar experienced the loss of two daughters, Sashikala and Manjula. Walter was the first recipient of the government program Young Farmers Group, which allowed the Ambrose family to purchase a small parcel of farm land, in Kilinochchi, Sri Lanka. It allowed Walter to develop his green thumb. He spent countless hours tending to all the trees, grape vines and flowers on the land. This also allowed the family the opportunity to raise a few animals. When Walter wasn’t working or farming, he found great enjoyment riding his Indian motorcycle. Walter took his gardening expertise and worked for the City of Jaffna. He was a superintendent for the parks systems, taking care of all the flower gardens. In 1973, Walter moved to America to assist his brother in his veterinary business, in Spring Valley, Wisconsin. In 1974, his family joined him. In 1976, Walter moved to Brooklyn Center, MN and later built a home in Maple Grove, MN. At that time, his brother owned and operated Argo-K (a fertilizer company), where Walter managed the warehouse. He retired in 1998. Walter and Ariyamalar then moved in with their daughter Ida and husband Chris on Spring Lake, in Jordan, MN. In Walter’s spare time, he enjoyed fishing, fishing and more fishing. He relished the times fishing with the grandchildren. Walter continued to expand his green thumb in the giant vegetable garden. When time allowed he and his wife enjoyed traveling all over the world visiting relatives and touring religious destinations. A devoted Catholic, Walter was always praying and attending Mass. In his later years, Walter enjoyed watching Mass on EWTN. A generous, caring and loving husband, papa, grandpa and great-grandpa, Walter always greeted you with a smile. Everyone had a special place in his big heart. Walter will forever remain in the hearts of his beloved wife, Ariyamalar; children, Ida (Chris) Mauk, Raymond (Paula) Ambrose, Irine (Brian) Hayes; grandchildren, Johnathan Mauk, Lauren (Michael) Hiegel, Morgan Mauk, McKinley Hayes, Lucas Hayes, Maria Hayes, Devin Ambrose, Natasha Ambrose, Dalton Ambrose, Mia Ambrose; great-grandchildren, Andrew Hiegel, Arya Hiegel, Theodore Hiegel, Nonawyhn Hayes, Payton Ambrose, Emryss Ambrose; siblings, Harry (Consi), Poovathy, Reggie (Ranee), Fitzroy (Wanda), Manning (Sumathy), Kamala (Leon), Nimmi (Logan); many nieces, nephews, relatives and friends. Greeting Walter in eternal peace are his daughters, Sashikala and Manjula; parents; and two-infant sisters. The pain endured cannot be relieved, the loss can never be replaced, the memories can never be cast away; but with some amount of compassion, thoughtfulness, gentle words, one can surely help ease the pain. These condolence messages will help remind you, that although death separates us from one another in body, in spirit, the person always remains alive. Alive through the kind words they said to us, the caring deeds they did for us, the lesson that they taught us, and the example that they were to us. Let us remember them in our prayers, in our fond memories, in our everyday actions, so that remembrance brings joy, not tears. My deepest condolences to Thanga Aunty and childern..Walter uncle was a great inspiration in my life and his love and laughter will always be in my memories..
Our deepest sympathy to Kamala Aunty and rest of the family. My heartfelt sympathies go out to the family and friends. May you find some comfort in the promise found in Revelation 21: 3-4 and 1Thessalonians 4:14. Knowing that there is an opportunity to be reunited with loved ones.